Two Earth, Environment, and Physics students are using a drone to record and analyze the topography of a historic conservation property in Boylston, Mass. Their work will pave the way for other student research at the site. 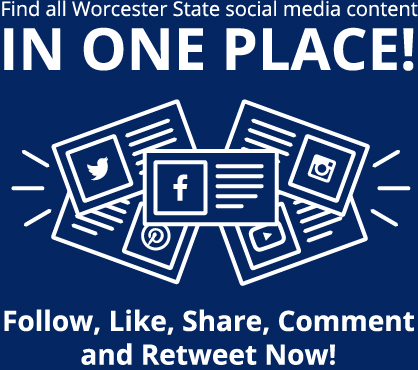 It’s part of a budding partnership between Worcester State University and the Hillside Restoration Project, a nonprofit organization managing the restoration, preservation, and reuse of the John B. Gough Estate at Hillside. In 2017, Professor of Earth, Environment, and Physics William Hansen, Ph.D., joined Associate Professor of History and Political Science Tona Hangen, Ph.D., and Professor of Biology Stephen Oliver, Ph.D., at Hillside to discuss how different academic departments “could use this property, enter into a relationship and do academic investigations, and use it to bring students” there, Hansen explains. All three are chairs of their respective departments. Before any formal plans are made, the faculty need to know more about the property and its potential. That’s where Farah Aubin, a senior geography major, and Lauryn Mulcahy, a junior environmental science major, come into the picture. 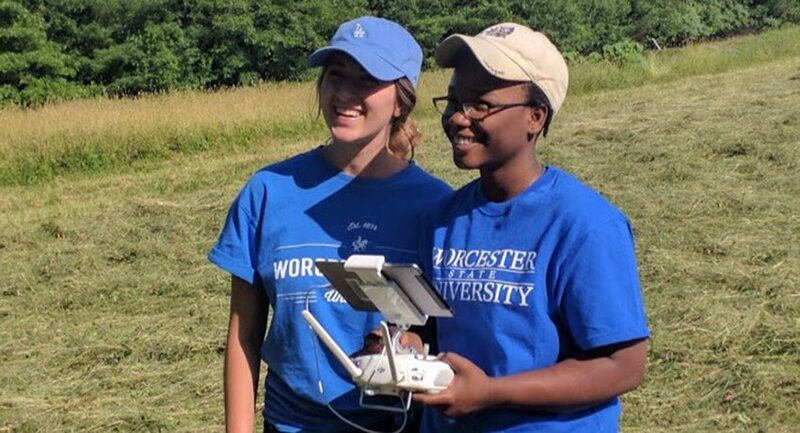 Aubin and Mulcahy, who were recruited by Hansen for the summer research internships, have spent most Tuesdays and Thursdays over the summer either flying a drone over pastures and forests at Hillside or in the GIS Lab at Worcester State analyzing the footage and Light, Texture, and Range (LiDAR) data. “The property has, for our purposes, a wide variety of great features to it,” Hansen says. Those include the remnants of the old farm, including foundations and stone walls, as well as buried mounds and disposal areas that might contain old pottery. Aubin and Mulcahy have been using the drone to “create sites in an old pasture that has grown back” and comparing the footage to old aerial photographs taken of the area between 1938 and 1952, he explains. “We want to mark off the site” and make sure it’s a good place to bring students. For Aubin, who has worked on various research projects with Hansen since her first year at Worcester State, the most memorable part of this internship is collecting the primary data that other students will use in class assignments. Mulcahy has enjoyed perfecting her ability to fly a drone. Her most memorable moment, though, happened while she and Aubin were collecting water-quality samples on Patch Pond. Aubin gathered the samples while she recorded them in a GPS app on her phone. It wasn’t until she was back on dry ground that she realized she failed to submit each sample location. Learning from the mistake “was a good experience,” she says. Researching the Hillside property has its challenges as well. For instance, there is a spring house in an old photograph, but Aubin and Mulcahy have been unable to find it with the drone or on foot. The LiDAR data of the property, which is available from the National Oceanic and Atmospheric Administration, doesn’t show it either. John Holbrook, a geoscience laboratory technician, hopes to have better luck finding it during the fall semester. Aubin and Mulcahy use the LiDAR data to plan what plant life and other topographical features to look for when they are at Hillside. Aubin and Mulcahy will continue their research on the Hillside property and Patch Pond through next academic year. “By the end of it, Professor Hansen wants us to have a full project and be able to teach other classes about it,” Mulcahy says. The Hillside property is one of about 65 area locations that the Earth, Environment, and Physics Department has captured with drone footage for research purposes, Hansen says. For sophomore Katelyn Duca, an unsuccessful class presentation sparked a dogged mission to get her fellow students to show support for pediatric cancer care and research. 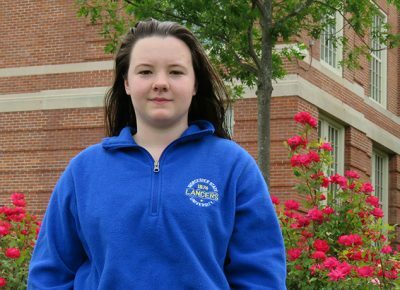 Her efforts resulted in a new student group and a generous scholarship. The presentation was part of an assignment for her first-year seminar class in the 2017 fall semester. Students were required to “find a movement” to . . .